“Over The Hill” Birthday Cake How To…. This is a short tutorial/how to on the “Over the Hill” Birthday Cake. This was one of the first “large” cakes I made, and looking back it is still one of my favourite cakes. Here is how I did it…. So, birthday cakes usually take on a theme; the garden, favourite film, hobby etc, its great to create a cake that really reflects the person the cake is for. I personally makes a cake feel really special! 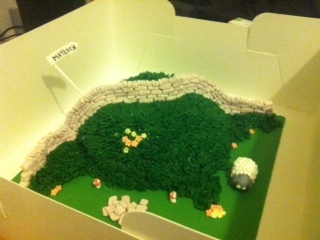 In this case the cake was created for a dry stone waller so naturally there was only one option for this cake…. 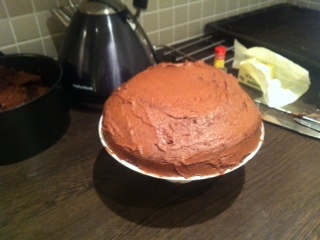 I started with a basic chocolate sponge cake. The cake was made in a 8 inch round tin. Once cooked is was left to cool in the tin before wrapping it up and leaving it in an air tight container over night. This let the cake settle and stay moist before cutting and decorating. When covering large areas with fondant icing, or you want a really bright/solid colour, I like to use the ready made coloured icing. I find this most useful for red, black and green, as depending on the colourings you have you can end up with pink, grey and a plae green. For this a wanted to create a proper grassy green. 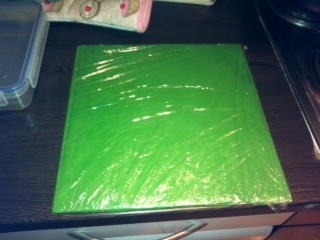 Once the board was covered with icing I wrapped it with cling film, to stop it going hard, until it was needed. Always store it in a cool place and keep it covered, you dont want bits of fluff etc sticking to your base! The first thing I did with the cake was cut it in half and fill the middle with chocolate buttercream icing, I then shaped the cake into a basic “hill” and coated it in chocolate buttercream icing using a palette knife. This is an easy shape to create! 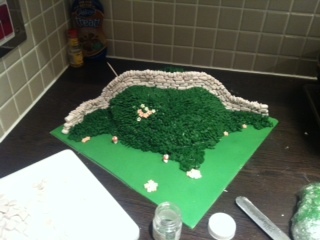 As you can see in the picture, it is starting to look a little more like a hill….So the next step is to add the “grass”. For the grass I made vanilla buttercream icing and coloured it using the extra green colouring (again to make a proper grass green rather than the minty green so many people end up with when making green buttercream). I piped the icing on using a grass/fur nozzle to create a nice grassy texture. A turn table is one of the most useful pieces of equipment you can have when decorating a cake, BUT don’t feel you have to run out and buy a turn table right at this moment: When I first started making cakes I made my own turntable by turning a gelato bowl upside down and putting a large-ish plate on top, this allowed me to turn the cake round. I reckon most people will have items in their kitchen cupboard that you could use to similar effect (or ask for a turn table for your next valentines/birthday/christmas present). 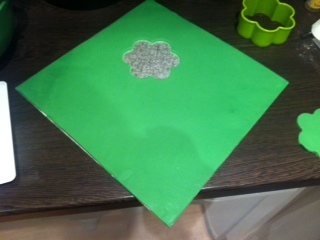 Once you have filled the gap with royal icing you can put the cake on to. 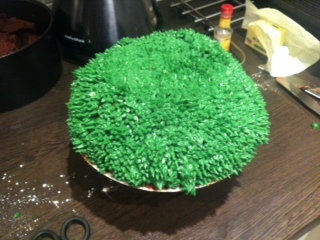 When the cake was in place I extended the grass round the bottom and out to the sides. This is where you can start to let you imagination run wild. I think it took me a few hours to build the stone wall. To do this I made blocks from sugar paste, for the colour I added black, brown and beige so they look like rocks. Obviously at this point you can add any decoration of your own, you could turn this little hill into a fairy garden, an animal paradise or add a tractor and some fencing for a lovely farm scene. I also added small flowers in yellow and pink, dotted around to add a bit of colour and nature to the cake. I used edible glue to stick the flowers in place and to stick the wall together. I used a paint brush to add the glue, but you can use the tip of your finger as well. 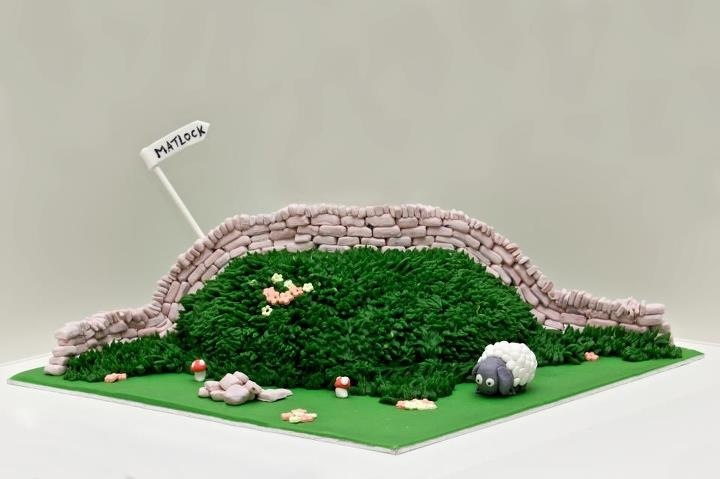 Once I had built the main wall, I added mushrooms, small piles of walling stone and even made a lovely little sheep to add to the scene. The last thing I added was the Matlock sign, which I made using a cake pop stick and sugar paste icing with an edible pen, alternatively you could paint the sign. 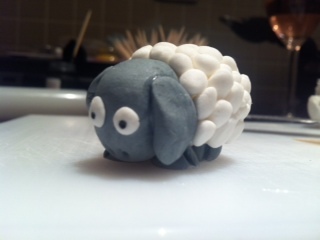 This lovely little sheep was really simple to make. A rectangle of white sugar paste icing, with lots of little balls of white sugar paste glued to it and a grey/black head and ears…Oh and 4 little rectangles of grey icing for legs! It’s been a whistle stop tour of this cake….